Two men were brutally beaten by about a dozen bouncers at the 40/40 Club in Atlantic City this weekend. The frenzied attack was caught on tape. New York City-based disc jockey “DJ Zeke” shot a video of what appears to be 13 staffers of the 40/40 Club kicking, beating and choking two patrons in a back parking lot early Saturday morning. Police confirmed that the incident caught on tape is real. They responded to a call about the fight at 4:20 a.m. Saturday. Police said bouncers asked Tyrell Durant, 26, and Leonard Clark, 25, both of Neptune, N.J., to leave the club for being disorderly and when the two men gave the bouncers a hard time, the beatings ensued. Durant later told police that club security also took his watch and money. Both men reported that they were also sprayed with a fire extinguisher by security personnel as they were taken out of the club, said police. In the video, DJ Zeke “reports” from his couch, and then shows the footage he captured of the beatings behind the club, which is owned by famed rapper Jay-Z and his business partner Juan Perez. The video begins with bouncers kicking a man on the ground in a back lot. 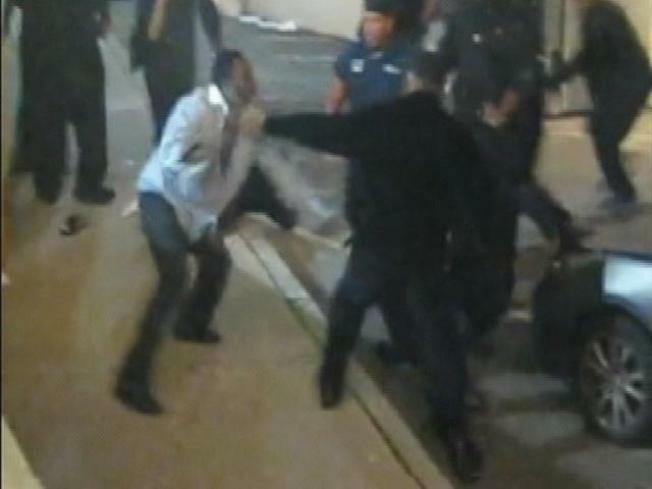 One of the club’s staff members then turns to punch a man who was standing to the side of the crowd and suddenly the whole crew of men in black clothes, some having the words “security” and “event staff” written on the back of their shirts, swarmed the second man, punching, restraining and choking him. “When the cops want this s**t, I’ve got this whole s**t on [video],” DJ Zeke can be heard saying at the end of the video. The 40/40 Club released a statement saying, “the 40/40 Club has no comment on the tape that is being circulated,” and claims the incident was provoked. According to police, 40/40 reported that Durant struck security officer David Gulley in the face.